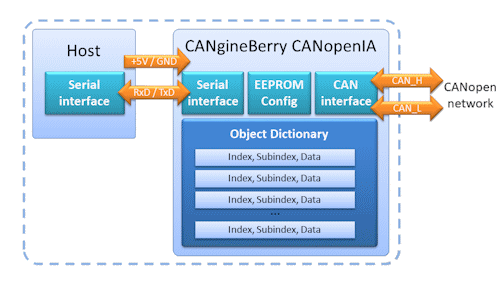 The CANgineBerry for CANopen is an active CAN Bus co-processor module that uses a regular UART communication channel towards the host system. With its independent 32-bit microcontroller, the CANgineBerry can easily execute CAN Bus protocols with tough timing demands such as CANcrypt or CANopen with response times of under 10 ms. Depending on the configuration, the CAN Bus communication can be up and running within 50 ms after power-on, even if the host system takes significantly longer to boot. CANopen Manager implementations also support read and write accesses to Object Dictionary entries of any node connected to the CANopen network. For more information visit the dedicated web page at www.canopenia.com. 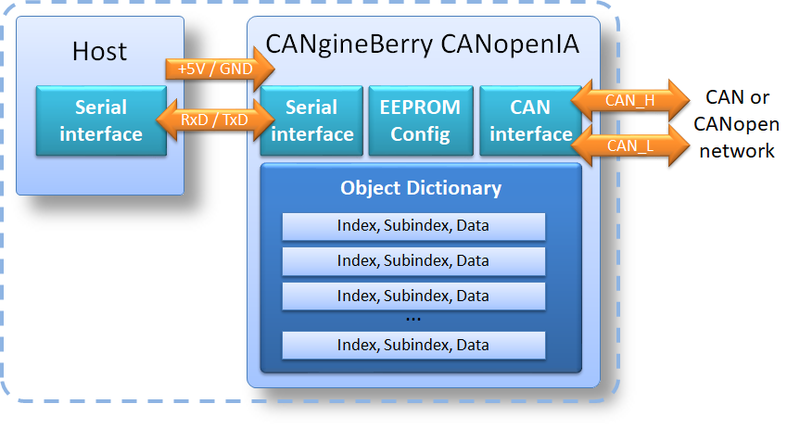 The CANgineBerry is equipped with a custom bootloader allowing the installation of one of the firmware packages provided by Embedded Systems Academy. The CANgineBerry fits directly onto the Raspberry Pi 3. Delivery includes a set of screw for proper fixation. Linux command line utilities can be executed to program and configure the CANgineBerry. Programm examples for Linux are provided per download from this web page..
CAN (Controller Area Network) is a serial communication protocol that was originally developed for the automobile industry. CAN is far superior to conventional serial technologies such as RS232 in regards to functionality and reliability and yet CAN implementations are more cost effective. CANopen, a higher layer protocol based on CAN, provides the means to apply the ingenious CAN features to a variety of industrial-strength applications. Many users, for example in the field of medical engineering, opted for CANopen because they have to meet particularly stringent safety requirements. Similar requirements had to be considered by manufacturers of other equipment with very high safety or reliability requirements (e.g. robots, lifts and transportation systems). Providing a detailed look at both CAN and CANopen, this book examines those technologies in the context of embedded networks. There is an overview of general embedded networking and an introduction to the primary functionality provided by CANopen. Everything one needs to know to configure and operate a CANopen network using off-the-shelf components is described, along with details for those designers who want to build their own CANopen nodes. 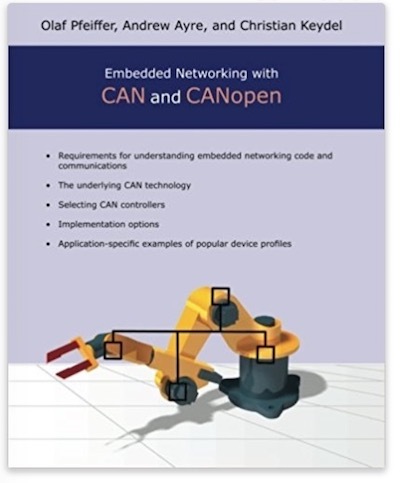 The wide variety of applications for CAN and CANopen is discussed, and instructions in developing embedded networks based on the protocol are included. In addition, references and examples using MicroCANopen, PCANopen Magic, and Vector's high-end development tools are provided. Click the button below to add the CANgineBerry - CANopen Module for Raspberry Pi to your wish list.